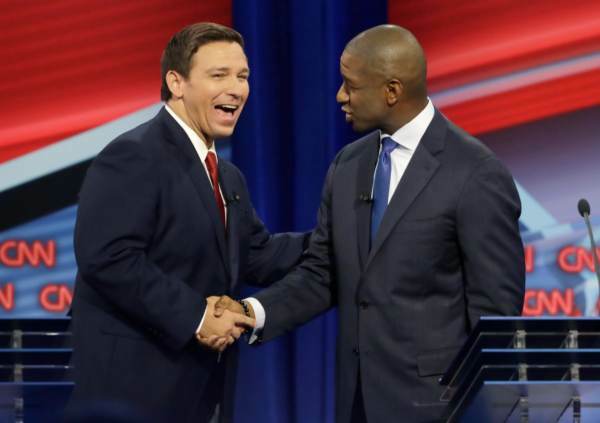 Florida’s Governor-elect Ron DeSantis won by a razor thin margin against Andrew “The Next Obama” Gillum, a victory marred by a nasty recount that set Florida ablaze for several weeks following the November elections. You can thank incompetent election chieftains like Brenda Snipes of Broward County for disgracing the state with her corruption and ballot tampering. The results have been certified and DeSantis’ Inaugural Ball is right around the corner, but so are inquiries into DeSantis and his associates. Florida progressives who just can’t believe that Andrew Gillum did not become Governor. Sources confirm that several far-left legislators are coordinating with progressive groups in Florida to demand investigations into DeSantis’ campaign, transition, inaugural activities and high-level appointments. They have already labeled him Alt-Right for being pro-Israel, attacked his inaugural committee, and have started laying the groundwork for a pity tour for Gillum over the FBI scandal that engulfed several of his close associates. Here’s how it will work, in some form or fashion. *Investigate DeSantis Knowledge of FBI Investigation Surrounding Gillum: Democrats will argue that newly released indictments of Gillum associates like Tallahassee Commissioner Scott Maddox are proof-positive that Gillum was never a target or of interest to the FBI. They will demand to know how DeSantis, who ran nearly $8 million worth of ads tying Gillum to the FBI investigation, knew Gillum was under investigation as he alleged in ads and on the campaign trail. Did DeSantis receive leaked intel from the FBI, a campaign associate or adversary of Gillum with a close proximity to the FBI’s investigation. No answer will suffice, and we’re not saying DeSantis should even entertain this wild behavior, but Democrats will try to frame the ads as provably false and somehow illegal or a violation of campaign finance laws. They will pose the question, whip the media into a frenzy, activate the progressive coalition, deliver fiery speeches on taxpayer time in the Florida capitol. Wash, rinse, repeat for as long as they can. Who benefited from his transition and inaugural will also be popular lines of attack. *Question Every Nominee / Attack Staffers: Florida Republicans still hold a majority in the Florida House and Senate, also owning a majority of the statewide cabinet officers. However, that will not stop the Democrats from taking a hard-line approach against each and every priority or appointment pushed by Governor DeSantis. At the same time, each staffer close to the Governor or involved in his political operations will be the subject of tortuous attacks from progressive groups who will continue to coordinate with the elected Democrats and mainstream media. *Protest Everything, Keep Progressive Operations Humming Into 2020: Andrew Gillum’s political committee is sitting on millions. So are other groups that were active in the 2018 election cycle in Florida. Add to that the myriad of committees and operatives bringing cash or manpower to Florida to lay groundwork for the 2020 Democratic Presidential Primary and progressive activists will have a blank check to run a continuous resistance to DeSantis. It will be a scrimmage and test of wills for 2020. Everything will be protested, well-known activists will be flown in, the media will cover these movements relentlessly. It all starts with the nationwide Women’s March on January 19th, 2019… which is less than two weeks after DeSantis is sworn in and less than a month away. Do not be surprised to see Governor-elect DeSantis and his allies accosted in public. They will infiltrate longstanding watering holes like the Governor’s Club and other locales known to attract high-level powerbrokers or elected officials. Undercover videos, bedlam in the streets, posturing on cable news and social media. The only thing we really do not know at this moment is how DeSantis will respond to these attacks. Will he surround himself with loyal and competent “true believers” or try to placate certain members of the lobbying class in Florida’s capitol who have their grip on the purse strings of the progressive movement? Governor-elect Ron DeSantis has an opportunity to send a clear message in the days immediately following his swearing in. He should start by firing Broward County Sheriff Scott Israel, cutting off the dishonest mainstream media from access to his administration and doing what Floridians elected him to do… SHAKE THINGS UP!